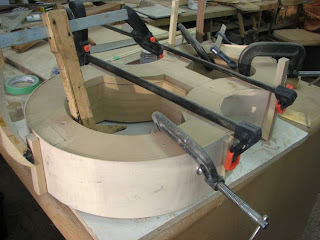 While I was in the mode of bending wood for the bindings of the $100 Challenge guitar, I decided that it was time to bend the rest of the sides for the viola da Gamba. I'll let them sit for awhile before doing the fine joining and gluing. All those clamps are simply holding them in place. Posted by Doug Ingram at 10:38 p.m.